Reviews of the first edition: '...Gerstein wants-very gently-to teach his students to think. He wants to show them how to wrestle with a problem (one that is more sophisticated than 'plug and chug'), how to build a solution, and ultimately he wants to teach the students to take a statement and develop a way to prove it...Gerstein writes with a certain flair that I think students will find appealing. For instance, after his discussion of cardinals he has a section entitled Languages and Finite Automata. This allows him to illustrate some of the ideas he has been discussing with problems that almost anyone can understand, but most importantly he shows how these rather transparent problems can be subjected to a mathematical analysis. His discussion of how a machine might determine whether the sequence of words 'Celui fromage de la parce que maintenant' is a legitimate French sentence is just delightful (and even more so if one knows a little French. 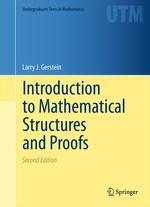 )...I am confident that a student who works through Gerstein's book will really come away with (i) some mathematical technique, and (ii) some mathematical knowledge. —Steven Krantz, American Mathematical Monthly 'This very elementary book is intended to be a textbook for a one-term course which introduces students into the basic notions of any higher mathematics courses...The explanations of the basic notions are combined with some main theorems, illustrated by examples (with solutions if necessary) and complemented by exercises. The book is well written and should be easily understandable to any beginning student.' —S. Gottwald, Zentralblatt This textbook is intended for a one-term course whose goal is to ease the transition from lower-division calculus courses to upper-division courses in linear and abstract algebra, real and complex analysis, number theory, topology, combinatorics, etc. It contains a wide-ranging assortment of examples and imagery to motivate and to enhance the underlying intuitions, as well as numerous exercises and a solutions manual for professors. The new material in this second edition includes four more topics in number theory, a brief introduction to complex numbers, and a section on graph theory and combinatorial topics related to graphs. Introducing these additional topics gives the reader an even broader view of the mathematical experience.